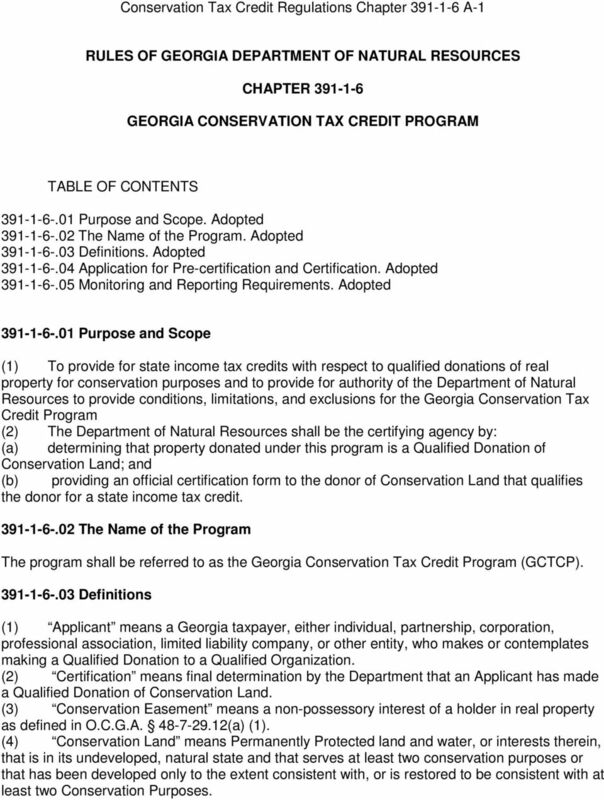 Download "Conservation Tax Credit Regulations Chapter 391-1-6 A-1 RULES OF GEORGIA DEPARTMENT OF NATURAL RESOURCES CHAPTER 391-1-6"
1 Conservation Tax Credit Regulations Chapter A-1 RULES OF GEORGIA DEPARTMENT OF NATURAL RESOURCES CHAPTER GEORGIA CONSERVATION TAX CREDIT PROGRAM TABLE OF CONTENTS Purpose and Scope. Adopted The Name of the Program. Adopted Definitions. Adopted Application for Pre-certification and Certification. Adopted Monitoring and Reporting Requirements. 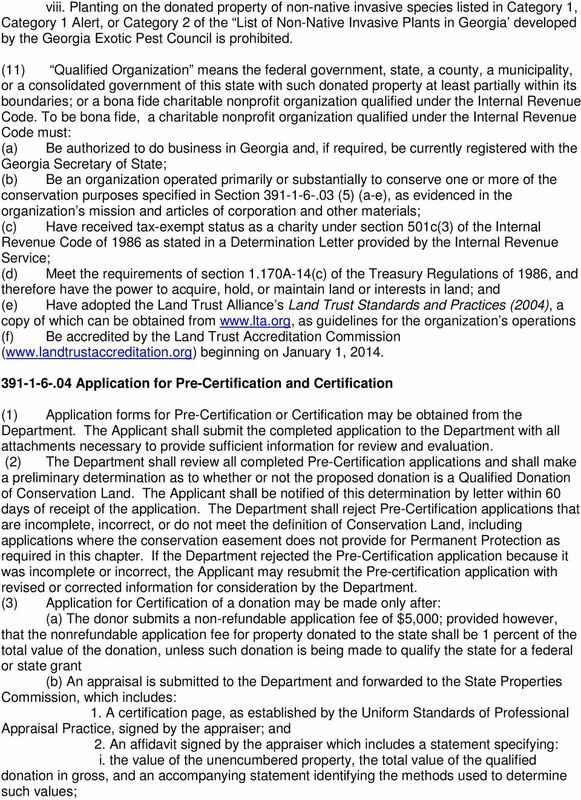 Adopted Purpose and Scope (1) To provide for state income tax credits with respect to qualified donations of real property for conservation purposes and to provide for authority of the Department of Natural Resources to provide conditions, limitations, and exclusions for the Georgia Conservation Tax Credit Program (2) The Department of Natural Resources shall be the certifying agency by: (a) determining that property donated under this program is a Qualified Donation of Conservation Land; and (b) providing an official certification form to the donor of Conservation Land that qualifies the donor for a state income tax credit The Name of the Program The program shall be referred to as the Georgia Conservation Tax Credit Program (GCTCP) Definitions (1) Applicant means a Georgia taxpayer, either individual, partnership, corporation, professional association, limited liability company, or other entity, who makes or contemplates making a Qualified Donation to a Qualified Organization. 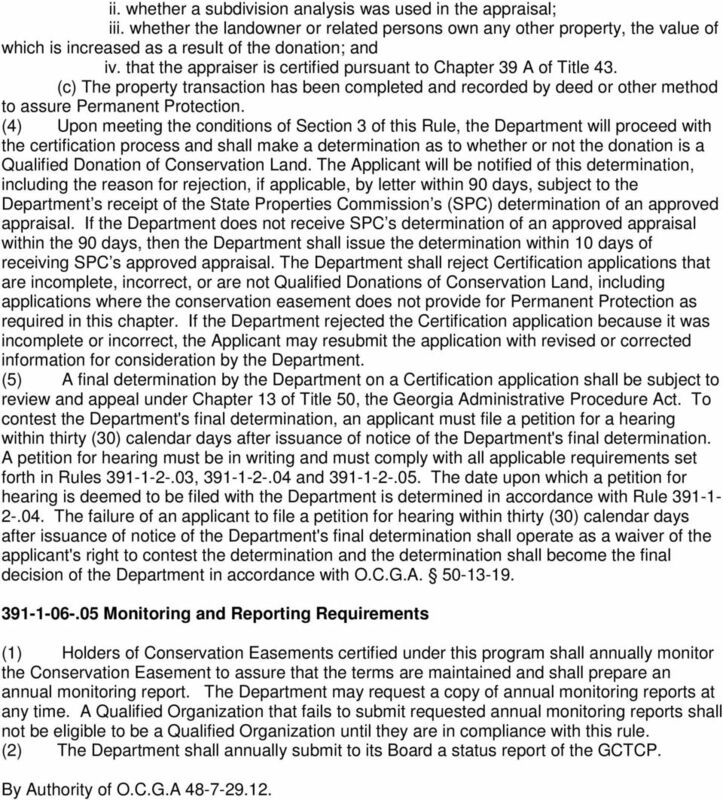 (2) Certification means final determination by the Department that an Applicant has made a Qualified Donation of Conservation Land. 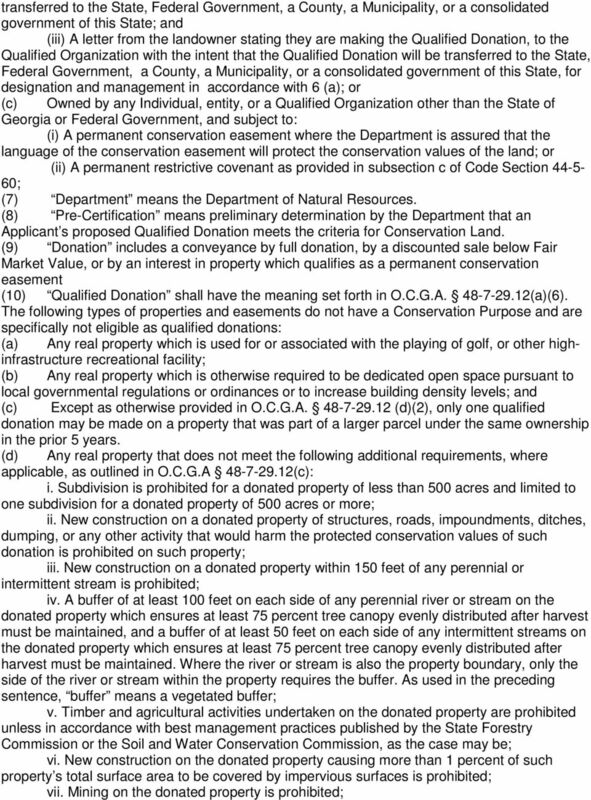 (3) Conservation Easement means a non-possessory interest of a holder in real property as defined in O.C.G.A (a) (1). (4) Conservation Land means Permanently Protected land and water, or interests therein, that is in its undeveloped, natural state and that serves at least two conservation purposes or that has been developed only to the extent consistent with, or is restored to be consistent with at least two Conservation Purposes. Buffer and Soil Loss Legislation Laws of Minnesota 2015, 1 st Special Session, Chapter 4, Article 4 Sec. 72. Minnesota Statutes 2014, section 103B.101, is amended by adding a subdivision to read: Subd. Easements to Protect Historic Properties: A Useful Historic Preservation Tool with Potential Tax Benefits National Park Service Technical Preservation Services 2010 What is a Historic Preservation Easement? Permanently preserving privately owned productive agricultural land ensures a stable land base for the future of the agricultural industry. ASSESSOR S CALENDAR. When in session, the board of county commissioners may cancel property taxes which for any lawful reason should not be paid. 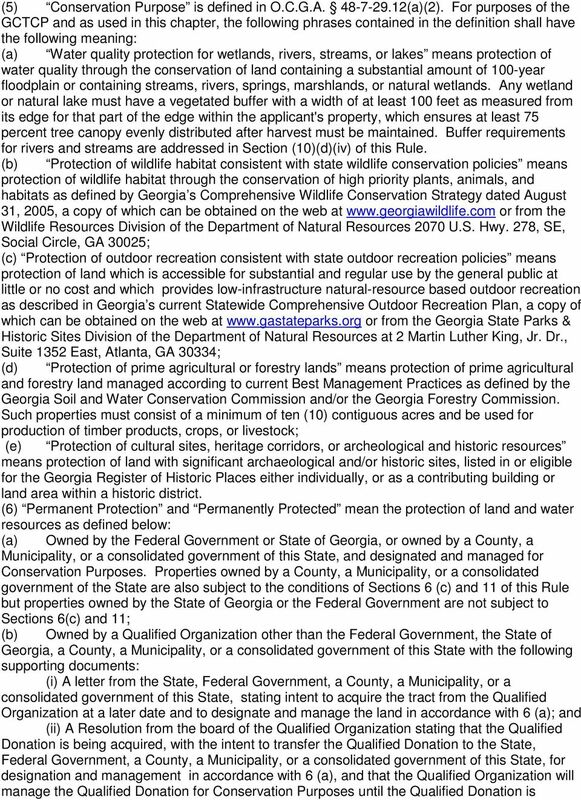 Chapter 22A Forest Conservation Law 2014 1 Table of Contents Table of Contents Article I - General... 4 Sec. 22A-1. Short title... 4 Sec. 22A-2. Findings and purpose... 4 Sec. 22A-3. Definitions... 4 Sec.